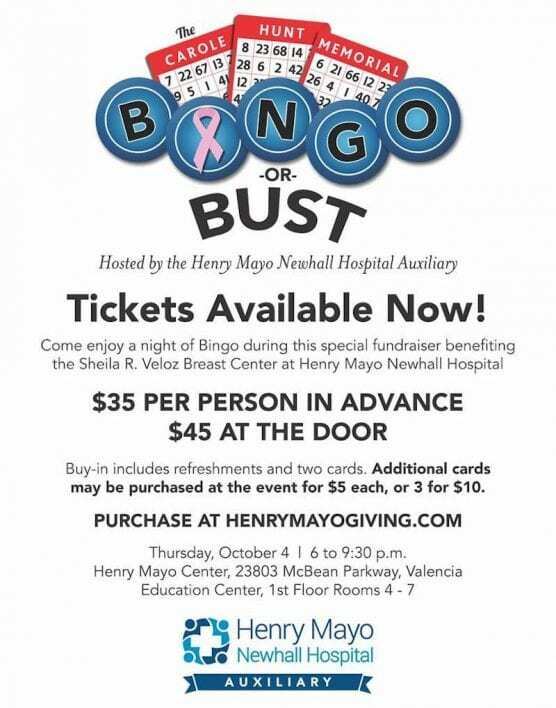 Enjoy a night of bingo during this special fundraiser benefiting the Sheila R. Veloz Breast Cancer Center hosted by the Henry Mayo Newhall Hospital Auxiliary. The event will take place Thursday, Oct. 4, from 6:00 p.m. – 9:30 p.m., in the Education Center, 1st Floor, Rooms 4-7, at Henry Mayo Hospital, located at 23803 McBean Pkwy., Valencia. $35 per person in advance or $45 at the door. Buy-in includes refreshments and two cards. Additional cards may be purchased at the event for $5 each or 3 for $10.